This week I have begun using a terrific application on my iphone. I downloaded YouVersion way back when I first got my phone, but I never realized the functionality of it until this week. My new favorite feature is the “Daily Reading” option located at the bottom of the home screen. One touch of the screen, and bam! I’ve got three separate passages ready to read, at my real (and virtual) fingertips. I’ve found that I can read it easily at my leisure…there is no longer ANY EXCUSE for me to put off sinking my teeth into God’s word. If I found myself without a phone or a Bible, I could still do my daily Bible reading by connecting to the YouVersion website. A very kind friend, LL, mentioned to a group of moms last week that she is amazed at how many Christians today don’t regularly read their Bibles. How, she wondered, could a person possibly get to know God without using the means He gave us to get to know him? How can we be sure we are following his commands if we aren’t IN him? She wasn’t judging or trying to make us feel guilty. She just handed out a Bible reading plan and shared how she started reading the Bible every day about eight years ago — and how that discipline has enriched her life as a wife, as a mother, and as a homeschool teacher. LL is someone I want to BE! Ever know anyone who possesses such joy that you just want to hang out around them? I’m hoping some of her joy will rub off on me as I get to know her better! She has more energy than anyone else I know. She’s in her forties and has gone back to school because she wants to learn how the brain learns. Guess what she does for every class she attends? She bakes huge cookies and feeds the other college kids! I’m sure they all adore her (I know I would!). I got to thinking: how does she manage to homeschool two kids, mentor two kids in college, teach a homeschool co-op once a week, bake amazing foods all the time AND take college courses, with JOY? It’s one of those God things. She KNOWS him. Like I want to KNOW him. So I asked her what Bible program she had on her phone…come to find out, I had it on mine but hadn’t (gasp) used it. Instead of beating myself up , I jumped right into the Bible Reading plan with both feet this week. As usual, when I am mining for gold in God’s word, He doesn’t disappoint! Part of today’s reading was in Deuteronomy chapters 6 and 7 (thus the quote above) What struck me first was the use of the pronoun your. That tiny little word, your, reached out through that phone screen and plucked at the contours of my heart. What does it mean to understand that my God is indeed God? It’s one of those sentences it is easy to skip over in an effort to get to the meaty stuff. 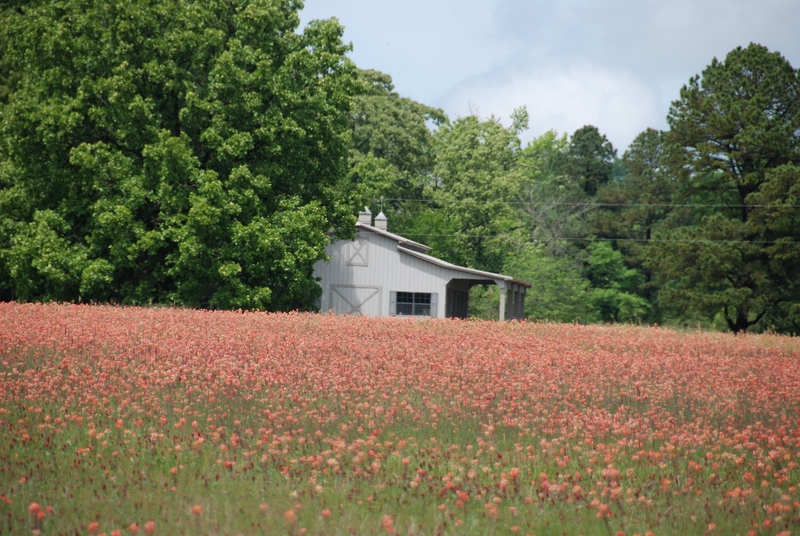 In the picture above, my eyes see the Indian paintbrushes dotting the field. They see the little barn in the background and the trees in the distance. But do I really know that scene? I did not cross the fence and get up close and personal with the wildflowers. I did not traverse the field to inspect the barn. Are there animals housed there, or is it deserted? What is unique about each wildflower? I can’t answer any of those questions because I just looked at the scene from afar and used the lens on my camera to draw it in closer. Sometimes I do that with God. I look at him from a long-range telephoto lens instead of up close with a microscope. I see a beautiful sunset and thank him. But am I learning to know Him? In order to truly know the wildflower scene, I would have to take a magnifying glass and investigate every inch…find out what bugs thrive in the field…what birds are nesting in which trees. In order to truly know God, I need to “see and find out” that the God whom I worship is indeed God, because this fact underlies everything else I could possibly learn about him and the world. Our God, the LORD (Yehovah), really and truly is the ONE God. He is the faithful or confirmed God. He is the one who used great signs and wonders to bring the Israelites out of slavery in Egypt. They — and we — are not merely doing what other peoples do and are bowing down to man-made idols or gods. We are aligned with THE God. The real one. The internalization of this truth will put a specific lens on my “camera” as I learn to know God. A sudden quiet descends on my soul when I step back. Stand still. Focus my intent on learning to know Him. How would he have me respond? And so, I begin a journey this week to, in the words of Jean Luc Picard of the Starship Enterprise…seek out new life and new understanding…to boldly go where I have not gone before. I will intentionally look for my God, who is indeed THE God, as I take pictures with my heart. Previous Previous post: Feeling Pressed? You’re On The Right Road!